Here’s a first! 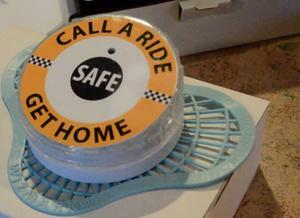 Talking urinal cakes that remind men to call a cab if they are too intoxicated to drive. No, I’m not making this up! According to an article in the Holland Sentinel out of Holland Michigan, several pubs, bars and restaurants in the area are installing these “urinal cakes” to hopefully reduce the number of impaired drivers on the roads. The device is motion activated and supposedly tells men who step up to use the urinal, in a female voice (of course!) to call a cab or a friend if they have had too much to drink. Oh, and it apparently reminds them to wash their hands as well.